The PIC firmware for the frequency counter can be downloaded from this link (includes hex file for all display variants and the assembly sourcecode). A PIC programmer which you need to program your PIC 16F628 is available on DL4YHF's website. Please do not ask me to send programmed PICs or even circuit boards to you, my spare time is too short - and you will find anything you need on these "do-it-yourself" pages ! If your counter shows a strange frequency initially, enter setup mode to set the frequency offset to zero (it sometimes happens that PIC programmers don't erase the EEPROM where the frequency offset is stored). A flashing decimal point indicates a frequency in kilohertz, a steady point indicates a frequency in Megahertz - which is more common for the intended use in dip meters and QRP transceivers. The circuit diagram is so simple that I didn't make a complete Eagle schematic for it yet (other builders did, see links). The first prototype was built on a breadboard with round pads. A very similar design could be used for a single-sided printed circuit board. Four bridges (drawn in red colour below) must be soldered on the board before fitting the seven-segment displays. Note that the crystal is mounted on the bottom side ! Some of the display signal are routed with thin enamelled copper wire, especially those between two pads. The resistors R4..R11 set the brightness and the power consumption. If you find some suitable low-current displays, use 1 kOhm or even more. Very old displays require more current, use 390 Ohms in that case. The PIC's output ports can source and sink 20 mA per pin, so the digit drivers are a slightly overloaded with 390 Ohm resistors per segment when displaying "8.". If you don't have to care for power consumption and want to use old displays with high current, use four PNP (!) transistors in the cathode(!) drivers as non-inverting emitter followers, no base resistors are required (base to PIC, collector to ground, emitter to common cathode). For the displays "SC39-11SRWA" by Kingbright it is unnecessary to use driver transistors, these high-efficiency displaye are bright enough with 1 kOhm current limiting resistor per segment. In Germany you can -or, at least, could- order these displays at Reichelt, look for "SC 39-11 RT" in their catalogue (in fact, these used to be SC39-11SRWA displays; aka "super bright" / high-efficiency display. Do NOT use the low-efficiency types like SC39-EWA. You will be disappointed by a dark display, at least with the resistor values stated above). Beware, other distributors of electronic components (like C..) sell such displays for much higher prices ! For the second prototype, a 5-digit display was made on a single layer PCB shown below. The segment resistors were used to connect the display board with the PIC board (which is usually mounted in a 90° angle behind the display). To make connection between PIC and display board easier, a second firmware variant was created with slightly modified pin assignment. On this occasion, the PIC's clock frequency was increased to 20 MHz to have a better resolution at higher frequencies. Layout of the PIC board (display variant 2). The board contains the decoder for the 5th digit, and some breadboard area for the preamplifier (if needed). Print this image with exactly 300dpi, which can be achieved with IrfanView and other utilities. The image is 700 * 300 pixels large, so the board dimensions will be 2.33 * 1 inch, or 5.93 * 2.54 cm (check thisbefore etching..). The display is mounted on the lower side of the PIC board as shown below. The square pads near the display are the cathode connectors (from left to right: d1..d4 are outputs directly from the PIC, d5 is driven by transistor T1). Placement of the components on the PIC board (Ridiculously simple, isn't it ? But don't forget to place the bridge under the PIC socket before soldering !). This board is quite universal, I plan to use it for a PIC-based DDS generator too. 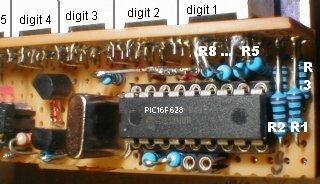 For the frequency counter, the connector pads "g","a","f","b" are not used because these four resistors R5..R8 are connected from the PIC board directly to thebackside of the first seven-segment digit (see below). The letters on the left side are the segments. The 5 cathodes are not routed to the side of the display PCB - it was impossible with such a small single-layer PCB. Use short pieces of wire to connect the square cathode pads on the display board to the square pads d1...d5 on the PIC board. Well, using the resistors to connect the CPU board with the display isn't really nice - feel free to do better (others did - see links). BTW this prototype perfectly fits in a miniature QRP transceiver called Miss Mosquita ! Common-cathode or common-anode display ? The two display variants (COUNTER1 and COUNTER2) described above are for 7-segment displays with common cathode (CC). But the downloadable software achive also contains a third firmware file (COUNTER3.HEX) for common-anode displays (CA). COUNTER3 uses the same pins as COUNTER2, but the control outputs are inverted. In the circuit, use PNP transistors for the CA display instead of NPN for T1 to drive the 5th digit, furthermore connect D1..D4 with reverse polarity, and connect D4 to Vsupp (positive supply voltage) instead of GND. The preamplifier consists of a single HF silicon transistor. I used a cheap BF199 from the junk box, it works well up to 30 MHz and with reduced sensitivity up to 50 MHz. Make the connection from the collector to the PIC counter input (pin 3 = T0CKI) as short as possible, because every pF of capacitance counts. With a BF199 in the preamp, R2 is 27 kOhm (+/-), and R3 must be as low as 560 Ohm to achieve the necessary bandwidth. The DC voltage at the collector and the voltage across R3 should almost equal - if not, adjust R2. To save area on the breadboard, you can leave away the preamplifier. If you want to feed the counter with a TTL signal, leave the preamplifier away, which saves another 4 mA. 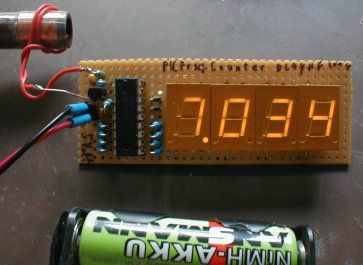 If the maximum frequency in your circuit is below 10 MHz, you may increase the value of R3 and R2 by the same factor (say R3=1.2 k, R2=56k) to save some current when using the counter in a battery-powered device. R1 sets the input impedance and also the sensitivity. With R1=330 Ohm, the prototype required an input voltage of 600 mVpp (peak-to-peak) at 40 MHz and 150 mVpp at 15 MHz. If you need a higher input resistance, add a FET buffer before the bipolar transistor. Or use a fast integrated comparator as input stage if you find one in your junk box. Added 2006-04: You will find a preamp with high input impedance on the pages of the DL-QRP-AG - see links ! The PIC firmware always drives a fifth digit as the least significant digit, if the measured frequency is above 10 kHz. Because there was no free output pin available on the PIC 16F628 to drive another digit, a logic combination from the first four digit multiplexer outputs was used (digits 1 ... 4). When all digit multiplexer outputs are passive (digits 1...4 = high), the optional fifth digit is driven. The schematics on the left side show one suggestion for a simple 'decoder' for the fifth digit, which basically is a four-input NAND gate realized with a few diodes, one resistor, and an NPN transistor. The diode between the emitter and ground is used because without it, the transistor may conduct unwantedly if its base-emitter threshold voltage (typically 0.5 to 0.6 V) was less than the forward voltage of the other diodes in this stage (which will be about 0.6 to 0.7 V for a 1N4148). Of course one could use Schottky diodes with lower forward voltages to eliminate the emitter diode, but 1N4148 are more likely to be found in a junkbox than BAT41's (or similar). If you don't need it, leave the 5th digit away to save some current and a few components. For this reason, the 'single zero' (if no input signal is present) is not displayed in the 5th, but in the fourth digit. The prototype (with R4..R11 = 390 Ohm) drew an average supply current of 40 mA (with 5 low-efficiency digits). With high-efficiency or low-current displays this can be significantly reduced. 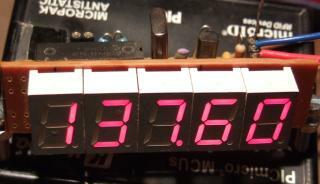 With 1kOhm segment resistors, the display draws a total current below 20 mA (with 5 digits "SC39-11"). The PIC itself draws about 4 mA at 20 MHz, and less than 1 mA when running at 4 MHz - so the preamp draws more current than the controller itself ! If the counter is used in a shortwave receiver or transceiver, you may want to add or subtract an offset value from the measured frequeny. The offset frequency is the same as the intermediate frequency in many cases, because the counter is usually connected to the receivers VFO (variable frequency oscillator). For this purpose, a programming mode (aka "setup mode") has been implemented in the firmware so you can enter an offset frequency without reprogramming (or even reassembling) the PIC firmware. The signal RA5 (pin 4 of the PIC 16F628) will is used to switch from normal counter mode into programming mode. Usually the level on RA5 is high because it is connected to the supply voltage via pullup resistor (10k to 22k). If you will never need to add or subtract a frequency offset, connect it permanently with the supply voltage (there must be a defined level on RA5, unfortunately it has no internal pullup resistor). By pulling RA5 low (connect pin 4 and pin 5 of the PIC with a small screwdriver), the firmware will be instructed to use the currently measured frequency as the new offset value. In other words, you must apply the offset frequency to the counter's input, wait until the value is displayed correctly, and then enter the programming mode as explained below. The program flow chart on the left shows how to enter programming mode, how to select a menu, and how to execute the associated function. To enter programming mode, press and hold the programming key (or connect pin 4 and 5 of the PIC with a small screwdriver), until the PIC shows "ProG" on the LED display. Then release the "key". You are now in the first menu of the programming mode. "Quit" : Aborts programming mode without changing anything. "Add" : Saves the previously measured frequency permanently, so it will be added in future. "Sub" : Saves the previously measured frequency permanently, so it will be subtracted in future. 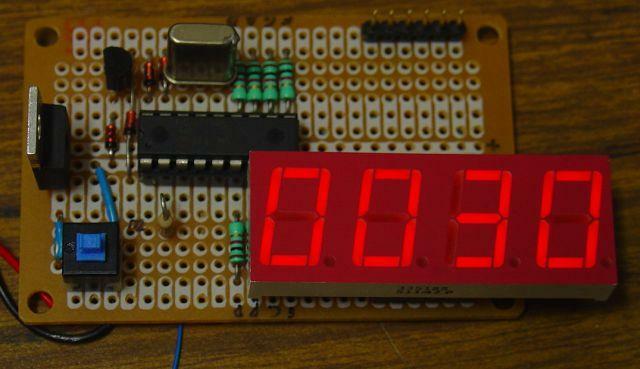 "Zero" : Sets the frequency offset to zero, so the display will show the measured frequency without offset. The previously programmed offset will be lost. "Table": Allows you to select a predefined offset value from a table. The table itself is also located in the PIC's data EEPROM, so you may find different values in it. When skipping through the table, the frequencies are shown in numeric form, like 455.0 (kHz), 4.1943 (MHz), 4.4336 (MHz), 10.700 (MHz). After selecting an entry (long keypress), you will be taken back to the main menu to select "Add" or "Subtract". "PSave" / "NoPSV": turns the power-saving on/off. In power-saving mode, the display is turned off after 15 seconds of no "significant" change in frequency, and on again as soon as the frequency changes by more than a few dozen Hertz (in the 3..4 MHz measuring range). Added in May 2006 for battery-powered equipment like QRP transceivers. There may be more menu items than shown here, but the principle remains the same. If the subtracted offset is higher than the counter's input frequency, the result of the subtraction is negative. 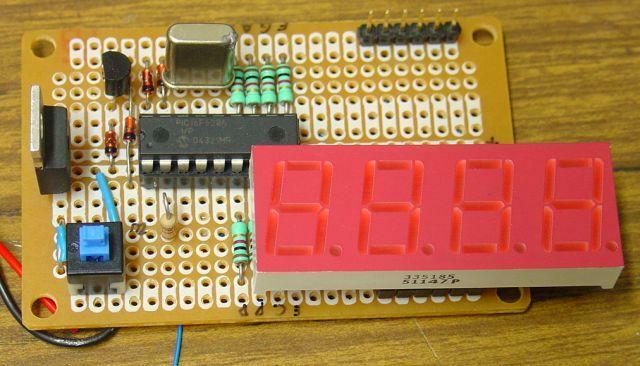 The frequency counter makes the result positive before displaying it. This way, you can use the counter also in receivers where f_IF = f_RX + f_LO, or f_RX = f_IF - f_LO which means increasing LO frequency means decreasing RX frequency (the counter will seem to "run backwards" but that's no mistake). Example for DL2YEO's 30 meter band QRP transceiver: f_RX = f_LO - f_IF = 14.314 MHz - 4.194 MHz = 10.120 MHz, which is the calculation inside the counter (f_LO=measured input, f_RX=display value, f_IF=programmed offset). If you don't need the 10-MHz-digit on the display, set the offset to -14.194 MHz instead of -4.194 MHz. This will give better display resolution, so you only need 4 digits (f_RX=10.120 MHz will be displayed as 120.0 kHz, which is sufficient because the receiver's tuning range is only 20 kHz anyway). Some commonly used IF frequencies can be recalled from the "Table" menu, so you don't have to measure or enter them yourself. Please contact me if you are one of those QRP homebrewers and want to have other frequencies in the built-in 'standard IF table'. Prepare a coarse frequency measurement for the automatic range switching: Program the asynchronous prescaler to divide by 64, so the highest external frequencies can be detected (theoretically 64 MHz, but this exceeds the PIC's specification). Count the input pulses for 1/16 second, using the PIC's TIMER0 module in counter mode. During this time, the display multiplexer keeps running. In fact, the counting loop takes exactly 50 microseconds, including the multiplexer routine. 1250 counting loops result in a gate time of 1/16 seconds. In the sourcecode, this is done in the subroutine 'count_pulses'. Decide which prescaler and which measuring interval should be used, depending on the coarse frequency measurement from step 2. Reprogram the counter's prescaler so the divided input frequency is below 1 MHz (which is the maximum input frequency for the hardware counter, if the PIC is clocked with 4 MHz). If the coarse measured frequency is way below 1 MHz, the prescaler is turned off to get the best possible frequency resolution. Count the pulses during the measuring interval (alias gate time), which is 0.25, 0.5, or 1 second. During this time, the display multiplexer keeps running. Overflows of the 8-bit timer register ("hardware") are counted by software in two other 8-bit registers, so the effective pulse counter has 24 bits (8 hardware bits plus 16 software bits while counting). Gate time finished -> stop counting pulses. If the hardware prescaler was active while counting (see step 4), multiply the pulse count with the prescaler ratio so we don't have to care for the prescaler setting in the following steps. If you know a bit about assembler programming: The multiplicator is always a power of two, so instead of a multiplication, the pulse count value (now expanded to 32 bit) is shifted left which is much easier on a PIC. If the gate time was 0.5 seconds, multiply the pulse count by 2; if the gate time was 0.25 seconds, multiply the pulse count by 4. The result is the input frequency in Hertz, no matter which prescaler ratio or gate time was used. Like in the previous step, this "multiplication" is in fact a simple bit-shifting operation. (Optional) Add the programmed frequency offset. If the result is negative, make it positive. Split the frequency into eight (!) decimal digits. This is tricky with a PIC, see sourcecode. It is realized by repeatedly subtracting powers of ten from the 32-bit frequency value, beginning with ten millions (because the highest, theoretically possible frequency is 64 MHz). Beginning with the first non-zero digit, convert five digits from binary code into seven-segment-patterns, and copy the result into the "display registers". The display multiplex routine which is executed while counting will write these registers to the LED display in steps 2 and 5 of the next main loop. Poll the 'programming function' input ("RA5"). If this digital input is low, enter programming mode (not explained here). If not, go to step 1 to begin the next measurement. Sounds tricky ? Well, you don't have to understand the internal function as long as you don't want to modify the firmware ! The DL-QRP AG use this counter in their "Super Dipper" (an interesting principle by the way). A description of the dipper -which contains the counter and preamp schematics- is available online here. The frequency counter is on a separate PCB, which is available as a kit from the DL-QRP-AG, see www.qrpproject.de/UK/DL4YHFcounter.html . Meanwhile, a second version with smaller display board is available; ideally suited for small monoband QRP transceivers. My own counter prototype now does a nice job in Miss Mosquita (a neat little QRP transceiver). A short description of the counter in german language is here . In 2011, Krzysztof (SQ3NQJ), made this variant of the counter firmware. It can be used with an external prescaler (divide by a power of two), to allow frequency measurements up to several hundred MHz (as much as the external prescaler allows). The external prescaler ratio can be configured in a new entry in the counter's setup menu. Thanks Krzysztof - several users had asked for such a feature ! Don, KC7ZOW, has more detailed construction notes, and screenshots of the config mode which may help you troubleshooting the display. Erich, VK5HSE, added support for other crystal oscillator frequencies in his firmware variant. In July 2015, his modifications could be downloaded from github.com/erichVK5/DL4YHF-FrequencyCounterVK5Mods, along with Gerber data for a printed circuit board. Lutz (DK3WI) built a portable counter which he describes here (in german language) . Richard (VA3NDO) has some photos of his counter on his website. Like all the others mentioned below, his board looks much cleaner than my prototype ! V. Kocka-Amort made a variant with a divide-by-four prescaler, using 74AC74 high-speed flip-flops, Schmitt-Trigger inputs, and a preamplifier with BFS17A. The circuit diagram, PCB (for Eagle Version 5.9.0 'free edition'), modified firmware, and photos are in this zipped archive. It was tested up to 172 MHz, but may possibly work up to 200 MHz. Lukasz (SQ2DYL) made a nice PCB for the counter, and translated the description into Polish language. His project can be found on this website of the SP-QRP group . Renato (PY2RLM) made his own PCB of the keyer, which is a bit larger than mine but has everything on the board (not using the resistors as 'wires' between CPU and the display. The link to his website is here. Jose Renato (PU2VFW) pointed me to this site with an article in portugese language. It contains a number of photos of the PCB, and the assembed kit. Luciano, PY2BBS, put up his site in 2010 with updated plans - also in portugese language, including Renaud's 6-digit variant (see below). Rahul (VU3WJM) created a new, single-sided PCB for the counter with 5 digits. He kindly made his layout available: You can download the copper tracks, the component overlay (with component values), and the solder stop mask as PDF files from here. (Note: the transistor drives the first digit, not the last one; but I don't have an up-to-date design). Renaud (F8FII) made a modified version of the counter which drives 6 digits, for the expense of the auto-ranging function (it uses the former decimal point output to drive the extra digit; the decimal points on Renaud's display are hard-wired). Description of the modified hardware, and the modified firmware are on F8FII's website. Jaak built this counter, with a more sensitive input amplifier using an NE592 . Jan Panteltjie modified the counter firmware to send the measured frequency through the RS-232 port. Details are on Jan's website. Joe (K3JLS) built a counter for his Century 21 transceiver - see pictures and description on his website . Shig (JA1XRQ) translated the manual, and the construction details, into Japanese. The translated document is available in PDF format on his website. Finally, there is another 'successful builder' who now sells an almost 1:1 reproduction of the 'DL4YHF counter' on ebay (with the minor addition of a crystal test oscillator). I don't mind doing that (since he sells the counter for a fair price, at least in February 2016), but unfortunately the kit maker / seller forgot to leave any note about the original developer and source. If you found this site via search engine, looking for "1Hz-50MHz Digital LED DIY Kits Crystal Oscillator Frequency Counter Tester", you will know the rest of the story. If you have problems with the kit mentioned above, please don't ask me to help you out, if there is something wrong with the counter (or the firmware, which seems to have been programmed erratically in a few occasions, with non-functional data EEPROM). необязательно один другой транзистор для предусилитель. А ПОС программист , который вам нужно запрограммировать ваш PIC 16F628 доступен на веб - сайте DL4YHF в.Пожалуйста , не спрашивайте меня , чтобы отправить запрограммированными ОСТО или даже печатные платы к вам, мое свободное время слишком мало - и вы найдете все , что вам нужно на этих "сделай сам" страниц! Если ваш счетчик показывает странный частоты на начальном этапе, введите режим настройки , чтобы установить смещение частоты до нуля (иногда случается , что ПИК программисты не стереть EEPROM , где смещение частоты сохраняется). Мигающей десятичной точкой указывает частоту в килогерц, устойчивая точка указывает частоту в мегагерцах - который является более общим для предполагаемого использования в погружных метров и QRP трансиверов. Схема настолько проста , что я не сделал полный Eagle схематической для него еще (другие строители же смссылки ). Первый прототип был построен на макете с круглыми подушечками. Очень похожий дизайн может быть использован для односторонней печатной плате. Четыре моста (изображены красным цветом ниже) должны быть запаяны на плате перед установкой дисплея семисегментный. Обратите внимание , что кристалл , установленный на нижней стороне! Некоторые из сигнала индикации проложены с тонким эмалированного медного провода, особенно между двумя подушечками. Резисторы R4..R11 установить яркость и энергопотребление. Если вы нашли несколько подходящих дисплеев слаботочные, использовать 1 кОм или даже больше. Очень старые дисплеи требуют больше тока, используйте 390 Ом в этом случае. Выходные порты ПОС может источником и приемником 20 мА на контакт, так что цифрыводители слегка перегружен 390 Ом резисторов на сегмент при отображении "8.". Если вы не должны заботиться о потребляемой мощности и хотите использовать старые дисплеи с высоким током, используйте четыре PNP (!) Транзисторов в катоде (!) Водителей , так как неинвертирующий эмиттерные повторители, никакие базовые резисторы не требуются (основание для PIC, коллектор на землю, эмиттера к общим катодом). Для дисплеев "SC39-11SRWA" по Kingbright нет необходимости использовать транзисторы драйвера, это высокоэффективный displaye достаточно яркий с 1 кОм резистор для ограничения тока на сегмент. В Германии вы можете -или, по крайней мере, could- заказать эти дисплеи на Reichelt, обратите внимание на "SC 39-11 RT" в своем каталоге (на самом деле, это имело обыкновение быть SC39-11SRWA дисплеи, также известный как "супер яркий" / высокая -efficiency дисплей. Не используйте типы низкоэффективных как SC39-EWA. Вы будете разочарованы темный дисплей, по крайней мере , со значениями резисторов , указанных выше). Осторожно, другие дистрибьюторы электронных компонентов (например , C ..) продавать такие дисплеи для гораздо более высоким ценам! Для второго прототипа, 5-значный дисплеем был сделан на одной печатной плате слоя, показанной ниже.Резисторы сегмента были использованы для подключения дисплея платы с платой PIC (который обычно устанавливается в 90 ° угол позади дисплея). Для того, чтобы связь между ПИК и табло проще, второй вариант прошивки был создан с немного измененным назначением контактов. В связи с этим, тактовая частота ПИК была увеличена до 20 МГц, чтобы иметь более высокое разрешение на более высоких частотах. компонент значения для варианта 2 (как показано выше): R1 ... R8 = 1K, R9 = R10 = 10K, D1..D4 = 1N4148, Т1 = BC547 или аналогичный, С1 = С2 о 22pF (выбрать их, чтобы настроить кристалл ровно 20 МГц), C3 = 100nF, Q1 = 20 МГц, PIC: 16F628 запрограммирован с прошивкой "counter2.hex". Макет ПОС платы (дисплей вариант 2). Плата содержит декодер для 5 - го разряда, а некоторые макетных область для предварительного усилителя ( в случае необходимости). Печать изображения с точно 300dpi, которое может быть достигнуто с IrfanView и других коммунальных услуг. Изображение 700 * 300 пикселей большой, поэтому размеры доски будут 2.33 * 1 дюйм, или 5,93 * 2,54 см (проверить это , прежде чем травление ..). Дисплей ,установленный на нижней стороне доски ПОС , как это показано ниже. Квадратные площадки рядом с дисплеем расположены разъемы катодные (слева направо: d1..d4 являются выходами непосредственно из ПОС, d5 приводится в движение транзистор Т1). Размещение компонентов на плате PIC (Смехотворно простой, не так ли? Но не забудьте поставить мост под ПОС гнездо перед пайкой!). Эта плата является достаточно универсальным, я планирую использовать его для ПОС на основе генератора DDS тоже. Для счетчика частоты, разъем колодки "G", "а", "F", "б", не используются , так как эти четыре резистора R5..R8 связаны с доски PIC непосредственно к задней стороне первого семисегментных значный (смотри ниже).Буквы на левой стороне сегменты. В 5 катоды не направляются на стороне печатной платы дисплея - это было невозможно с таким маленьким однослойной печатной плате. Используйте короткие куски проволоки , чтобы соединить квадратные катодные колодки на плате дисплея на квадратные площадки d1 ... d5 на борту ПОС. КСТАТИ этот прототип прекрасно вписывается в миниатюрный QRP трансивер под названием Miss Mosquita ! С общим катодом или дисплей с общим анодом? Два варианта отображения (COUNTER1 и COUNTER2), описанные выше, для 7-сегментных дисплеев с общим катодом (CC). Но загружаемое программное обеспечение achive также содержит третий файл прошивки (COUNTER3.HEX) для общего анода дисплеев (CA). COUNTER3 использует те же контакты, как COUNTER2, но управляющие выходы перевернуты. В схеме, использовать PNP транзисторы для дисплея CA вместо NPN для T1 управлять 5-ю цифру, кроме того, подключить D1..D4 с обратной полярности, и подключить к D4 Vsupp (положительное напряжение питания) вместо GND. Предусилитель состоит из одного ВЧ-кремниевого транзистора. Я использовал дешевый BF199 из коробки барахла, он хорошо работает до 30 МГц и с пониженной чувствительностью до 50 МГц. Выполните подключение от коллектора к входу ПИК счетчика (вывод 3 = T0CKI) как можно более коротким, потому что каждый пФ отсчетов емкости. С BF199 в предусилителе, R2 составляет 27 кОм (+/-), и R3 должны быть столь же низким, как 560 Ом для достижения необходимой пропускной способности. Напряжение постоянного тока на коллекторе и напряжение через R3 должны почти равны - если нет, то отрегулируйте R2. Чтобы сохранить область на макете, вы можете оставить прочь предусилитель. Если вы хотите кормить счетчик с сигналом TTL, оставить предусилитель прочь, что экономит еще 4 мА. Если максимальная частота в цепи ниже 10 МГц, вы можете увеличить значение R3 и R2 на тот же коэффициент (скажем, R3 = 1,2 к, R2 = 56k), чтобы сохранить часть тока при использовании счетчика в батарейным питанием устройства , R1 устанавливает входное сопротивление, а также чувствительность. При R1 = 330 Ом, прототип требуется входное напряжение 600 mVpp (от пика до пика) на частоте 40 МГц и 150 mVpp на 15 МГц. Если вам нужна более высокое входное сопротивление, добавить буфер FET перед биполярного транзистора. Или используйте быстрый интегрированный компаратор в качестве входного каскада, если вы найдете в вашем нежелательной поле. Добавлено 2006-04: Вы найдете предусилитель с высоким входным сопротивлением на страницах DL-QRP-AG - см ссылки ! Программно-аппаратные средства ПИК всегда приводит в действие пятую цифру в качестве значащей цифры, если измеренная частота выше 10 кГц. Потому что там не было свободный выходной контакт доступен на PIC 16F628 для привода другой цифры, логическую комбинацию из первых четырех цифр мультиплексора выходов был использован (цифры 1 ... 4). Когда все цифры Мультиплексор выходы являются пассивными (цифры 1 ... 4 = высокий), опциональный пятая цифра приводится в движение. Схемы на левой стороне показывают одно предложение для простого "декодера" для пятой цифры, которая в основном состоит из четырех входов логического элемента реализуется с несколькими диодов, один резистор и транзистор NPN. Диод между эмиттером и землей используется, потому что без него, транзистор может проводить unwantedly, если его база-эмиттер порогового напряжения (обычно от 0,5 до 0,6 В) была меньше, чем прямое напряжение других диодов на этой стадии (которое будет около от 0,6 до 0,7 в для 1N4148). Конечно можно использовать диоды Шоттки с более низким напряжением вперед, чтобы устранить излучающего диода, но 1N4148, более вероятно, можно найти в ларь, чем BAT41 (или подобное). Если вам это не нужно, оставьте 5-ю цифру в сторону, чтобы сохранить некоторые нынешние и несколько компонентов. По этой причине «единого нуля" (если входной сигнал не присутствует) не отображается в 5-м, но в четвертой цифре. Прототип (с R4..R11 = 390 Ом) обратил средний ток питания 40 мА (с 5 цифр низкоэффективных). С высокой эффективностью или слаботочных дисплеев это может быть значительно снижена. С помощью резисторов сегмента 1kohm, дисплей рисует общий ток ниже 20 мА (с 5 цифрами "SC39-11"). Сама ПИК рисует около 4 мА на частоте 20 МГц, и менее 1 мА при работе на частоте 4 МГц - так предусилитель потребляет больше тока, чем сам контроллер! Если счетчик используется в коротковолновый приемник или приемопередатчик, вы можете добавить или вычесть значение смещения из измеренного frequeny. Смещение частоты совпадает с промежуточной частотой , во многих случаях, так как счетчик , как правило , подключен к приемникам (ГПД переменной частоты). Для этого, режим программирования ( так называемый "режим настройки" ) был реализован в прошивке , так что вы можете ввести смещение частоты без перепрограммирования (или даже повторной сборки) встроенное программное обеспечение ПОС. RA5 сигнал (контакт 4 ПОС 16F628) будет используется для переключения из нормального режима счетчика в режим программирования. Обычно уровень на RA5 высок , так как он подключен к напряжению питания через резистор (подтягивающий 10k до 22k). Если вы никогда не будет нужно добавить или вычесть смещение частоты, подключите его на постоянной основе с напряжением питания (должен быть определен уровень на RA5, к сожалению, не имеет внутреннего подтягивающего резистора). Потянув RA5 низкий (соедините контакт 4 и 5 контакт из ПОС с помощью маленькой отвертки), встроенное программное обеспечение будет дано указание использовать текущее измеренное частоту в качестве нового значения смещения. Другими словами, вы должныприменить смещение частоты на вход счетчика , подождите , пока не появится значение правильно, а затем войти в режим программирования , как описано ниже. Блок - схема программы слева показывает , как войти в режим программирования, как выбрать меню, и как выполнить соответствующую функцию. Для входа в режим программирования, нажмите и удерживайте клавишу программирования (или соедините контакт 4 и 5 ПИК с помощью маленькой отвертки), пока не появится ПИК "Prog" на светодиодном дисплее.Затем отпустите "ключ". Теперь вы в первом меню режима программирования. "Выход": Прерывает режим программирования, ничего не меняя. "Добавить": Сохраняет ранее измеренной частоты на постоянной основе, так что она будет добавлена ​​в будущем. "Sub": Сохраняет ранее измеренной частоты на постоянной основе, поэтому он будет вычитаться в будущем. "Ноль": Устанавливает смещение частоты к нулю, так что дисплей будет показывать измеряемую частоту без смещения. Ранее запрограммированное смещение будет потеряно. "Таблица": Позволяет выбрать предопределенный значение смещения из таблицы. Сама таблица также находится в EEPROM данных ПОС, так что вы можете найти различные значения в нем. При пропуске через таблицу, частоты представлены в числовой форме, как и 455,0 (кГц), 4,1943 (МГц), 4,4336 (МГц), 10,700 (МГц). После выбора записи (длительное нажатие), вы вернетесь в главное меню, чтобы выбрать "Добавить" или "Вычесть". "PSave" / "NoPSV": превращает энергосбережения вкл / выкл. В энергосберегающем режиме дисплей выключается через 15 секунд не "значительного" изменения частоты, и снова, как только частота изменяется более чем на несколько десятков Герц (в диапазоне измерения 3..4 МГц) , Добавлено в мае 2006 года для оборудования с батарейным питанием, как QRP трансиверов. Там может быть несколько пунктов меню, чем показано здесь, но принцип остается тем же самым. Пример для DL2YEO 30 метрового диапазона QRP трансивера 's: f_RX = f_LO - f_IF = 14,314 МГц - 4,194 МГц = 10,120 МГц, что вычисление внутри счетчика (f_LO = измеренный вход, f_RX значение = дисплей, f_IF = запрограммированное смещение). Если вам не нужен 10-МГц-цифры на дисплее, установите смещение на -14.194 МГц вместо -4.194 МГц. Это даст более высокое разрешение дисплея, так что вам нужно только 4 цифры (f_RX = 10,120 МГц будет отображаться как 120,0 кГц, что является достаточным , поскольку диапазон настройки приемника составляет только 20 кГц в любом случае). Некоторые часто используемые частоты ПЧ может быть вызвана из меню "Таблица", так что вам не нужно измерить или ввести их самостоятельно. Пожалуйста, свяжитесь со мной, если вы один из тех QRP домашних пивоваров и хотят иметь другие частоты в встроенный "стандартной IF таблицы. Подготовьте грубую измерения частоты для переключения автоматического диапазона: Программа асинхронного предделителя разделить на 64, так что самые высокие внешние частоты могут быть обнаружены (теоретически 64 МГц, но это превосходит спецификацию ПОС). Количество входных импульсов на 1/16 секунды, используя ПИК TIMER0 модуль в режиме счетчика. В течение этого времени, мультиплексор дисплей продолжает работать. На самом деле, цикл подсчета занимает ровно 50 микросекунд, в том числе рутина мультиплексора. 1250 счетные петли приводят к времени затвора 1/16 секунды. В исходный код, это делается в подпрограмме 'count_pulses'. Решите, какой делитель частоты и который интервал измерений следует использовать, в зависимости от измерения грубой частоты с шага 2. Перепрограммирование делителем счетчика поэтому разделить входной частоты ниже 1 МГц (что максимальная входная частота для аппаратного счетчика, если ПИК работает на частоте с 4 МГц). Если грубая измеренная частота значительно ниже 1 МГц, предделитель включен выкл , чтобы получить наилучшее разрешение по частоте. Подсчитайте импульсов в течение измерительного интервала (псевдоним временного окна), который составляет 0,25, 0,5 или 1 секунда. В течение этого времени, мультиплексор дисплей продолжает работать.Переполнение из 8-разрядного регистра таймера ( "аппаратного") подсчитываются программным обеспечением в двух других 8-битных регистров, поэтому эффективный счетчик импульсов имеет 24 бит (8 бит аппаратных плюс 16 программных битов при подсчете). Ворота время закончена -> остановка подсчета импульсов. Если оборудование предделитель был активен при подсчете (смотрите шаг 4), умножьте рассчитывать импульс с отношением предварительным делителем , поэтому мы не должны заботиться о настройке в предварительным делителем следующие шаги. Если вы знаете немного о программировании на ассемблере: мультипликатор это всегда сила двух, так чтовместо умножения, значение счетчика импульсов ( в настоящее время расширена до 32 бит) сдвигается влево , который гораздо проще на ПОС. Если время затвора составляет 0,5 секунды, умножить количество импульсов на 2; если время ворот было 0,25 секунды, не умножить количество импульсов на 4. В результате входная частота в Гц, независимо от того, который был использован коэффициент предделителя или время затвора. Как и в предыдущем шаге, это "умножение", на самом деле простой бит смены операции. (Необязательно) Добавьте запрограммированную частоту смещения. Если результат отрицательный, сделать его положительным. Разделение частоты на восемь (!) Десятичных цифр. Это сложно с ПОС см исходный код. Оно реализуется путем многократного вычитания степеней десяти от значения частоты 32-битной, начиная с десяти миллионов (из-за самой высокой, теоретически возможная частота составляет 64 МГц). Начиная с первой ненулевой цифры, преобразовать пять цифр из двоичного кода в семисегментных-шаблонов, и скопировать результат в "регистры дисплея". Дисплей мультиплекс процедура, которая выполняется во время подсчета будет писать эти регистры для светодиодного дисплея с шагом 2 и 5 следующего основного цикла. Опрос ввод 'Функция программирования "(" RA5 "). Если этот цифровой вход низкий, войти в режим программирования (не описано здесь). Если нет, то перейти к шагу 1, чтобы начать следующее измерение. Звучит сложно? Ну, вы не должны понимать внутреннюю функцию до тех пор, пока вы не хотите изменять прошивку! DL-QRP AG используйте этот счетчик в их "Супер медведица" (интересный принцип, кстати). Описание ковша -Какой содержит счетчик и предусилителя schematics- доступен в Интернете здесь . Счетчик частоты находится на отдельной печатной плате, которая доступна в виде комплекта из DL-QRP-AG смwww.qrpproject.de/UK/DL4YHFcounter.html~~dobj . В то же время, вторая версия с меньшим табло доступна;идеально подходит для небольших приемопередатчиков monoband QRP. Мой собственный счетчик прототип теперь делает хорошую работу в мисс Mosquita (аккуратный маленький QRP трансивер). Краткое описание счетчика на немецком языке находится здесь . В 2011 году Кшиштоф (SQ3NQJ), сделал этот вариант прошивки счетчика. Он может быть использован с внешним предделителе (делить на степени двух), чтобы обеспечить измерение частоты до нескольких сотен МГц (столько же , сколько внешний делитель частоты позволяет). Внешнее отношение предделитель может быть сконфигурирован в новой записи в меню настройки счетчика. Благодаря Кшиштоф - несколько пользователей просил такую особенность! Дон, KC7ZOW, имеет более детальные строительные заметки и скриншоты из режима настройки , которые могут помочь вам устранять неисправность дисплея. Эрих, VK5HSE, добавлена поддержка других частот кварцевых генераторов в его варианте прошивки. В июле 2015 года, его модификации могут быть загружены с github.com/erichVK5/DL4YHF-FrequencyCounterVK5Mods~~pobj , наряду с данными Gerber для печатной платы. Лутц (DK3WI) построил портативный счетчик , который он описывает здесь (на немецком языке) . Ричард (VA3NDO) имеет несколько фотографий его счетчик на своем сайте . Как и все другие упомянутые ниже, его плата выглядит намного чище , чем мой прототип! В. Kocka-Amort сделал вариант с предделителе деления на четыре, используя 74AC74 высокоскоростные шлепанцы, входы Шмитт-триггер, и предусилитель с BFS17A. Схема, печатная плата (для Eagle версии 5.9.0 'бесплатной версии'), модифицированной прошивки и фотографии в этом сжатом архиве . Он был протестирован до 172 МГц, но может сработать до 200 МГц. Лукаш (SQ2DYL) сделал хороший PCB для счетчика, и перевел описание на польском языке. Его проект можно найти на этом веб - сайте группы SP-QRP . Ренато (PY2RLM) сделал свой собственный PCB от манипулятором, который немного больше , чем у меня , но есть все на борту (не используя резисторов в качестве "проводов" между центральным процессором и дисплеем. Ссылка на его сайт находится здесь . Хосе Ренато (PU2VFW) указал мне на этот сайт со статьей в португальские языке. Он содержит ряд фотографий PCB, а также комплект assembed. Лучано, PY2BBS, расфасованные свой сайт в 2010 году с обновленными планами - также в португальские языке, втом числе 6-значного варианта Рейно (см ниже). Рахул (VU3WJM) создал новый односторонней печатной платы для счетчика с 5 цифр. Он любезно сделал его макет доступны: Вы можете загрузить медные дорожки , то компонент наложения (со значениями компонентов), а также припой стоп маску в виде PDF - файлов отсюда. (Примечание: транзистор приводит в движение первую цифру, не последний, но у меня нет последнюю современный дизайн). Renaud ( F8FII ) сделал модифицированную версию счетчика , который управляет 6 цифр, за счет функции автонастройка (он использует прежний вывод десятичной точки для приведения в действие дополнительную цифру, десятичные точки на дисплее Рейно жестко проводной) , Описание модифицированного оборудования, и модифицированной прошивке находятся на веб - сайте F8FII в .
Яак построили этот счетчик, с более чувствительным входного усилителя с использованием NE592. Jan Panteltjie модифицировали прошивку счетчика для отправки измеренной частоты через порт RS-232.Подробности на сайте Яна . Джо (K3JLS) построил счетчик для его Century 21 приемопередатчиком - посмотреть фотографии и описание насвоем сайте . Shig (JA1XRQ) перевел руководство и строительные детали, на японский язык. Переведенный документ доступен в формате PDF на своем сайте . Наконец, есть еще один «успешный строитель» , который теперь продает почти 1: 1 воспроизведение 'DL4YHF счетчика' на EBay (с незначительным добавлением тестового генератора кристалла). Я не против того, что делает (так как он продает счетчик по справедливой цене, по крайней мере , в феврале 2016 года), но , к сожалению ,комплект производитель / продавец забыл оставить любую ноту о оригинальным разработчиком и источника. Если вы нашли этот сайт через поисковую систему, ищет "1Гц-50МГц цифровой светодиодный DIY комплекты Кварцевый генератор частотомера Tester", вы будете знать остальную часть истории. Если у вас есть проблемы с набором упомянутых выше, пожалуйста , не спрашивайте меня , чтобы помочь вам, если что - то не так со счетчиком (или встроенного программного обеспечения, который , кажется, был запрограммирован хаотично в нескольких случаях, с нефункциональным EEPROM данных).